Recently, I shared about all the incredible things American Express Serve Cash Back offers. If you missed it, American Express Serve Cash Back is a prepaid debit card that offers 1% cash back on purchases and money management tools at your fingertips. 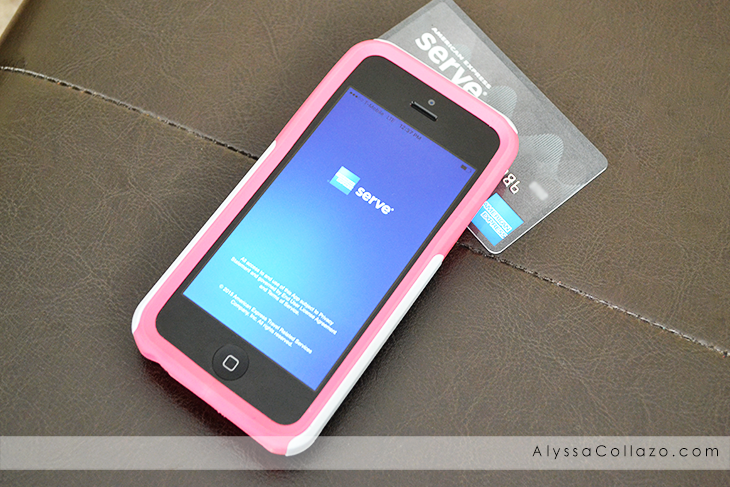 Today, I want to share my experience using my American Express Serve Cash Back Card. It was so simple using my American Express Serve Cash Back Card as my debit card. The fact that I knew how much money I had to spend made things so much more enjoyable. Not that paying bills are enjoyable. But you get the point. For me, paying bills and grocery shopping are always at the top of my to-do list. I love shopping but I have to make sure things at home are taken care of first. I decided to use my American Express Serve Cash Back Card to pay for my daughter's monthly dance tuition, fill up on gas and pick up a few groceries. Needless to say, it was like pulling out my debit card, only I was earning cash back for using my American Express Serve Cash Back Card. The best part? The cash back you earn while paying bills or shopping is added to your account immediately and is ready for your use at anytime. Simply log in and redeem the amount at your convenience. So if you're like me and like keeping things simple especially when paying bills, American Express Serve Cash Back is perfect for you. Are you ready to sign up yet? You can register on-line or purchase the prepaid debit card at a retailer for up to $3.95 depending on the retailer. There is no credit check, minimum balance or hidden fees. Earning cash back for paying bills is pretty awesome. But having peace of mind knowing my money is safe and I can access it anytime I want makes American Express Serve Cash Back that much better. Be sure to follow American Express Serve on Facebook and Twitter. We don't really get a great deal of cash back deals here in the UK - what a brilliant incentive!! I wish they would get in line over here! Sounds like a wonderful incentive for frequent users of this service. It is nice to know that when we pay bills we get something back! I would love to earn cash back when I go shopping or pay bills. What a great incentive! I love cards with perks! It's great that the cash back earned with this card is available immediately! I'll definitely check it out! This is one of my favorite incentives. Cards that have perks definitely encourage me to grab that card before a card that doesn't. I love the idea of having prepaid cards like this! It's the perfect way to budget and avoid going into debt. Great for Christmas shopping too! That's awesome that you can budget whole earing perks. I will definitely be checking it out. Cash back is always the best incentive. I definitely need to check out this card as it sounds like it has great perks. I was just looking into getting a credit card with cash back options. Getting cash back is always the best incentive when it comes to credit card offers. Credit card perks are what I LIVE for hahaha maybe not really - well yes - you get the jist! ; ) I love American Express, when I first got a credit card this was the second because of all of the perks and constant rewards that come along with it especially with Ticketmaster. I mainly use mine for concert tickets! Earning cash back is awesome. I'm happy to hear about the service. Getting cash back is always a great incentive. I do not have any credit cards but if I did this is one I would get for sure. Getting cash back for purchases and bill paying sounds great. It can really add up. I love getting cash back on our purchases! It's amazing how quickly your purchases (and cash back) add up! I used to have the Serve card, and then I traded it in for Bluebird because it gave me double the Walmart bucks at the time (AmEx doesn't let you have both). I'm hoping they do that promotion again. I'm up to almost $8 in Walmart money and I'd love to make it $16!